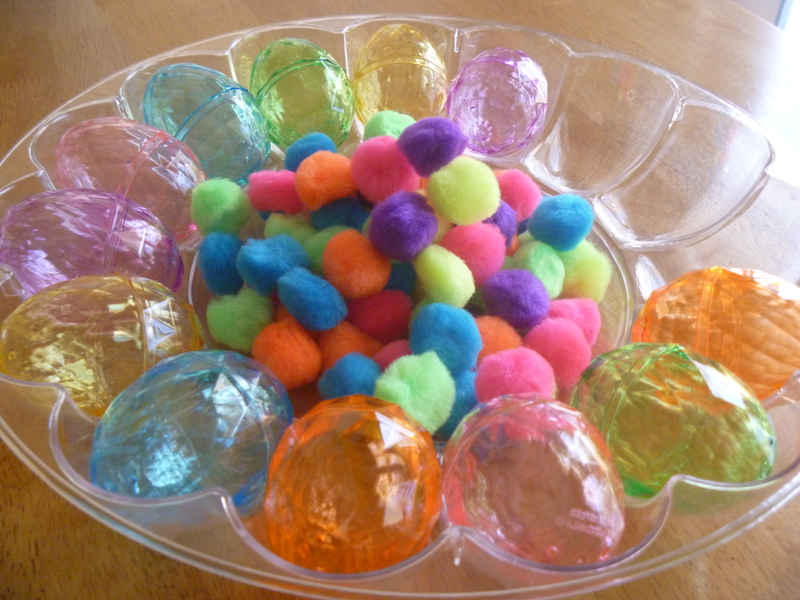 Last year I discovered the simple beauty of plastic Easter eggs and fuzzy pom-poms. With Easter right around the corner I’m bringing these back! It usually buys me at least 30 uninterrupted minutes. I can almost hear my own thoughts while finishing the dishes! 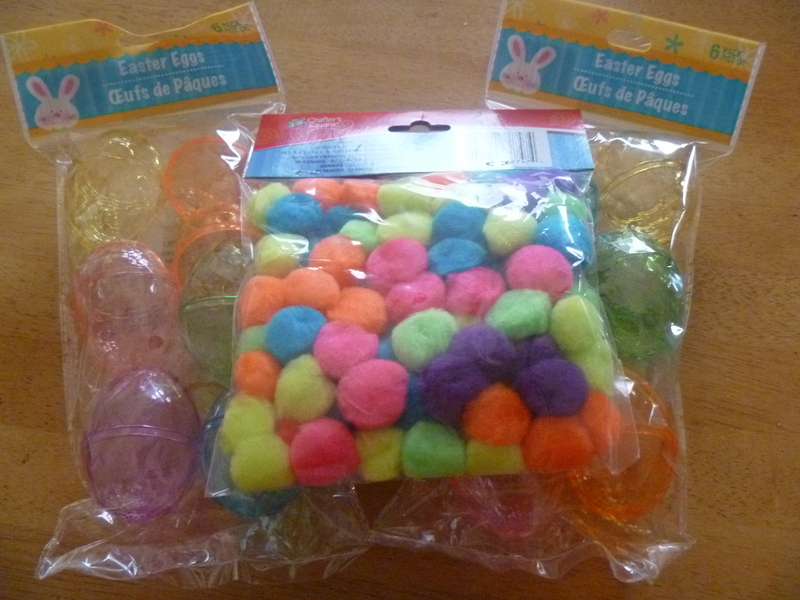 First, I picked up some plastic eggs and pom-poms at the dollar store. Pick up items at any dollar store. Next, I dumped them into a deviled egg tray for easy access and storage. That’s it! Done! The kids will take care of the rest! (If you don’t have pom-poms you can use cotton balls). You can find an egg tray similar to this one at the dollar store. I just happened to have one on hand. You can also recycle an egg carton to store the eggs in. Use whatever works for you. The first things my girls do is sort and match the colors by placing the pom-poms into the matching colored egg. 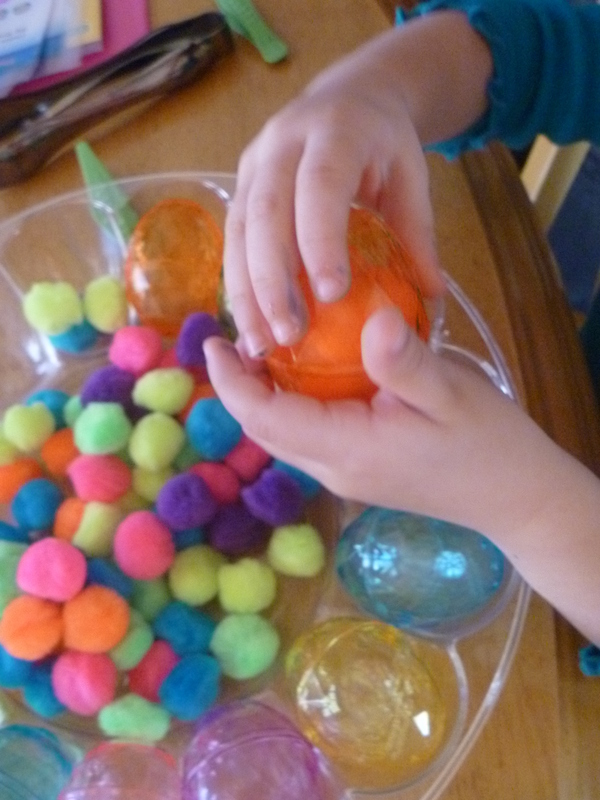 Next they enjoy using kid sized plastic tweezers to count out the pom-poms and fill the eggs. 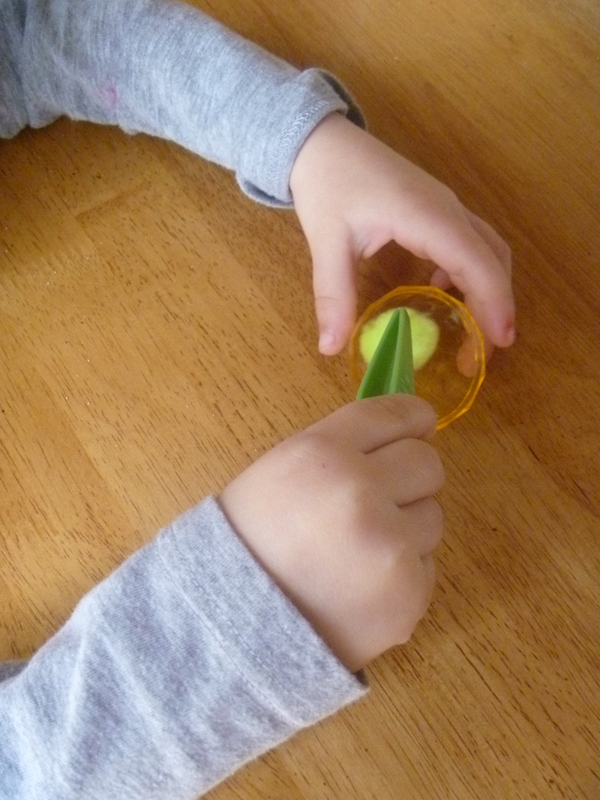 (This is a great activity for developing fine motor skills). Then they just like to make up their own games through pretend play. 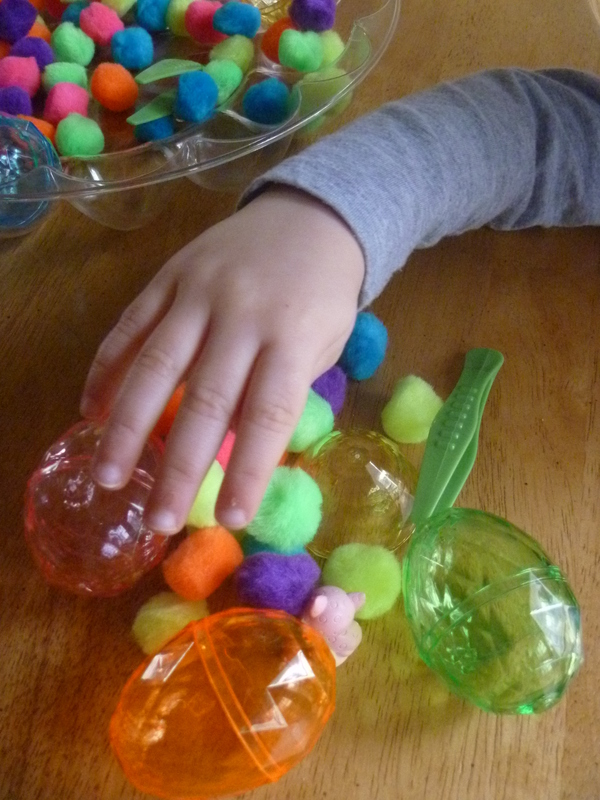 They grab handfuls of pom-poms and pile them up and mix them up. Sometimes they pretend to go shopping for eggs and fill up an empty shopping bag. No matter which scenario they choose, we almost always end with – you guessed it- an Easter egg hunt. They like to take turns hiding the eggs and finding them. Of course I have to help look for the eggs too. Last year when I first introduced this to my girls they were 28 months old. I was worried they’d eat the pom-poms, so I sat nearby while they played with them. 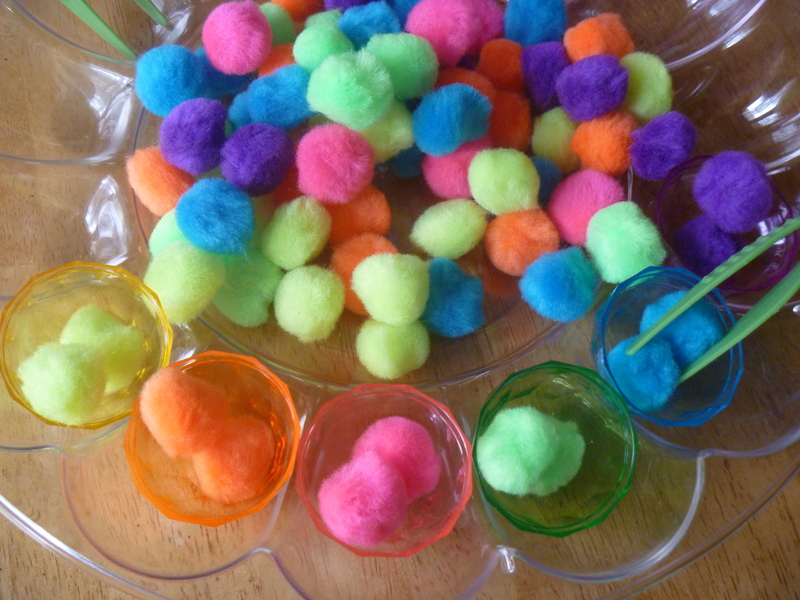 They also enjoyed taking them into the bath tub, dumping the pom-poms into a bowl to mix with a spoon, and just comparing the fuzzy feeling of the pom-poms with the smooth feeling of the eggs. This year they found a new way to play- Pom-pom soccer! Use a straw to blow pom-poms across the finish line. 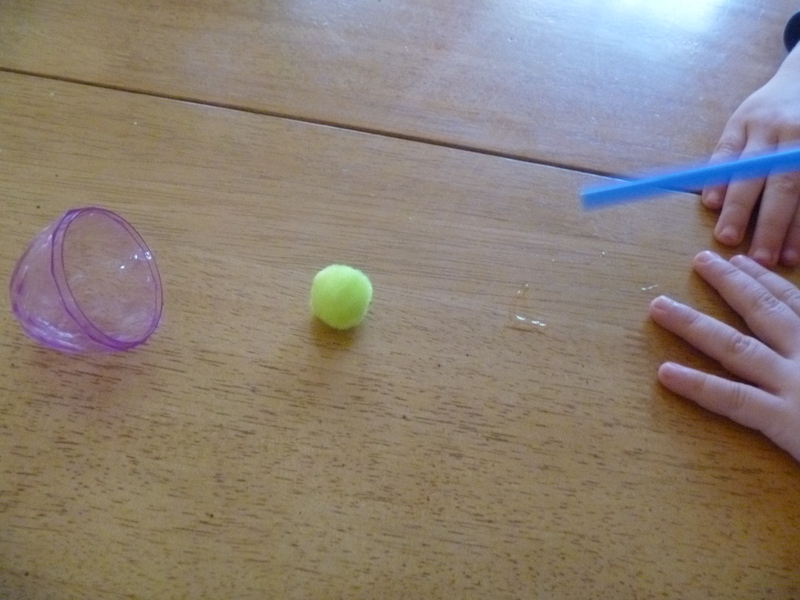 The first one to blow a pom-pom into an egg using a straw wins. I love that there are so many different ways to play with these simple things many of us already have around the house. 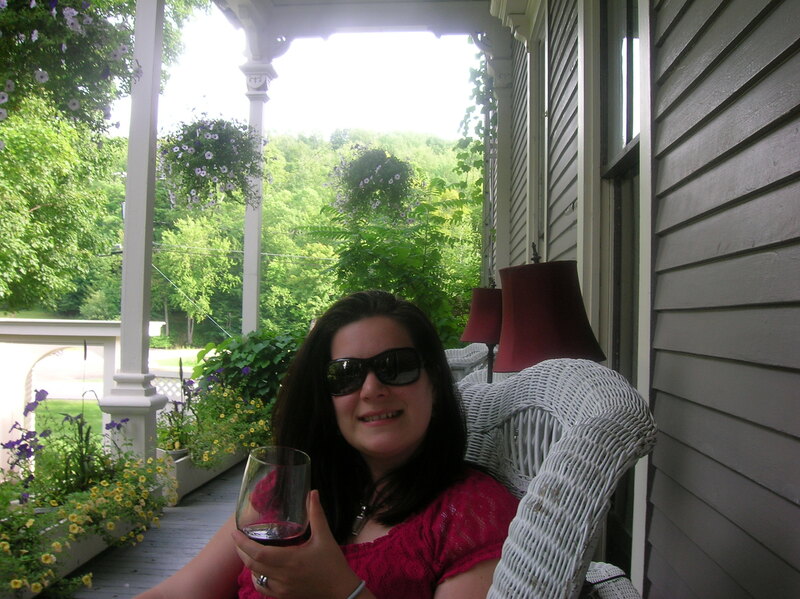 Got a favorite simple (mess free) activity you’d like to share? Comments Off on Eggless Easter Fun!